There’s nothing worse than not hearing how a story ends, and that was how many record buyers felt after hearing Millie Jackson’s critically acclaimed fourth album Caught Up, which was released in 1974. Caught Up was essentially a concept album, but in truth was like a musical soap opera about a love triangle, where Millie Jackson played the leading roles. On side one, Millie Jackson plays the role of “the other woman,” before assuming the role of the woman whose husband has cheated on her on the second side. Although Millie Jackson breathes life, meaning and emotion into both roles, when Caught Up drew to a close, there was seemed no conclusion, no real ending. It was one of these cliffhangers where the listener wondered what happened next? Did the husband leave his wife, or did they stay together, and if so, what became of them? In modern parlance, there was no there was no ‘closure,’ and over half-a-million record buyers were left hanging, wondering what became of Mille Jackson’s two characters? Little did anyone realise that the story that began on Caught Up was about to conclude on Millie Jackson’s fifth album Still Caught Up, which has just been reissued on vinyl by Southbound Records, an imprint of Ace Records. Still Caught Up was a much-anticipated album, that was released in 1975. That was all in the future. Buoyed by the success of Caught Up, which had just been certified gold after selling in excess of 500,000 copies, Millie Jackson began work on her much-anticipated fifth album Still Caught Up. Millie Jackson and her songwriting partner King Sterling penned The Memory Of A Wife, Tell Her It’s Over and Do What Makes You Satisfied which were joined by five cover versions that concluded the story that began on Caught Up. This included You Can’t Stand The Thought Of Another Me and Leftovers which were written by singer, songwriter and producer Phillip Mitchell. They were joined by Tom Jans’ Loving Arms, Richard Kerr and Gary Osborne’s Making The Best Of A Bad Situation and Mac Davis and Mark Davis’ I Still Love You (You Still Love Me). These songs would complete the story of Still Caught Up, which was recorded at Muscle Shoals Sound Studio and Criteria Studios, Miami, Florida. Fortunately, for Millie Jackson and Brad Shapiro who had produced Caught Up, they were once again able to secure the services of the original Muscle Shoals Rhythm Section for the recording of Still Caught Up. This included drummer Roger Hawkins, bassist Barry Hood and guitarist Jimmy Johnson. They were augmented by keyboardist Barry Beckett, guitarist Pete Carr and percussionist Tom Roady. Adding backing vocals were Charles and Sandra Chalmers, Sandy and Donna Rhodes and Janie Fricke. This was the band that accompanied Millie Jackson as she played the wronged wife and the other woman on Still Caught Up. Once Still Caught Up was completed, Spring scheduled the release for 1975, hoping that it would replicate the success of Caught Up. 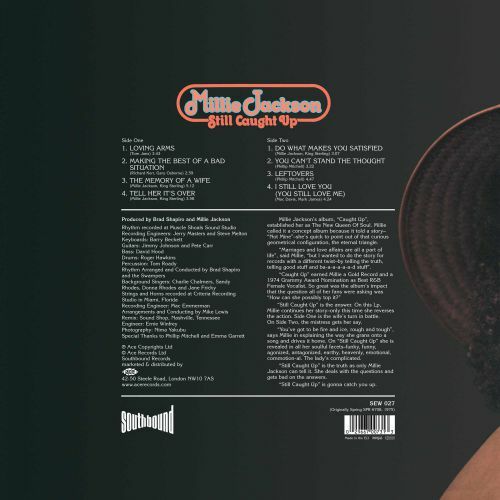 That wasn’t going to be easy as Caught Up has reached twenty-one in the US Billboard 200 and four in the US R&B charts, which resulted in Millie Jackson’s first gold disc. 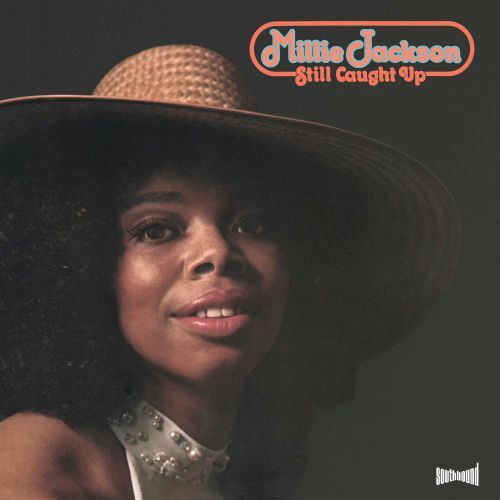 However, with over 500,000 record buyers waiting to hear how the story that began on Caught Up ended on Still Caught Up, Spring had high hopes for Millie Jackson’s fifth album. Especially, when critics hailed Still Caught Up as a fitting followup to Caught Up. Even the self-styled dean of rock critics gave Still Caught Up a B+, which was high praise indeed. However, it was the record buyers who would have the final say when Still Caught Up was released later in 1975. Despite having won over critics, when Still Caught Up was released in 1975, it stalled at a lowly 112 in the US Billboard 200 and twenty-seven in the US R&B charts. This was a far cry from the success of Caught Up a year earlier. For Millie Jackson the commercial failure of Still Caught Up came as a huge blow, as Caught Up had transformed her fortunes, and had launched her career. Things didn’t improve when Loving Arms was released as a single, and it failed to trouble the charts. Loving Arms was the one that got away for Millie Jackson. When Leftovers was released as a single, it struggled to eighty-seven in the US Billboard 100, which was another disappointment for Millie Jackson who had hoped to build on the success of Caught Up. In a way, Still Caught Up was the one that got away for Millie Jackson. Still Caught Up opens with Making the Best of A Bad Situation, where Millie Jackson’s ex-husband knocks on the door and delivers a short monologue reminding her it’s their anniversary. Millie Jackson then delivers a worldweary vocal against a slow backdrop of lush strings, piano, rhythm section and guitars. By then, there’s a degree of drama and sense of sadness, as the arrangement sweeps along and Millie Jackson reflects upon how she feels, admitting that she misses her husband, and although free, she is at a loss without him to share her life. Later, strings, chiming guitars, piano and soaring backing vocalists combine as Millie Jackson’s vocal is full of emotion and sadness as she continue to lay bare her soul. A short monologue opens The Memory of A Wife, before the arrangement grows in power and drama as the rhythm section, rasping horns, swirling strings, guitars and a piano combine to produce a punchy, dramatic arrangement as Millie’ Jackson delivers an angry, vocal. Midway through the track, calmness descends, and just twinkling keyboards, rhythm section and slow strings accompanying Millie Jackson’s monologue. It’s almost a warning shot fired across the bows of her husbands new lady, warning her about the pitfalls of their relationship. She even dispenses marital advice, on how to spot a straying husband, and the pitfalls of being the “other woman” against a meanders arrangement. After a second monologue, the song heads towards a dramatic conclusion, with blazing horns, piano, rhythm section and guitars accompanying Millie Jackson as she unleashes a vocal that is a mixture of power, anger and frustration as this emotional roller coaster draws to a close. The rhythm section and acoustic guitar accompany Millie’ Jackson’s monologue on Tell Her It’s Over, and quickly, she tells her ex-husband to tell his new girlfriend that their relationship is over. Meanwhile, her vocal grows both in power and emotion, while rapid-fire bursts of backing vocalists combine with guitars, keyboards as the rhythm section provide the heartbeat. Later, rasping horns and a Hammond organ accompany Millie Jackson’s confident and assured vocals as she lets her husband know just who is in charge. By now it seems, Millie has gained the upper hand in the relationship, during this emotionally charged track, but how long will this last? Just chiming guitars and slow, sweeping strings combine with the rhythm section and piano as What Makes You Satisfied meanders melodically along. Soon, it’s all change as Millie Jackson unleashes a swaggering vocal as soulful backing vocalists accompany her, as a piano, slow, moody bass and melancholy strings are key to the arrangement’s success. Meanwhile, rasping horns and crystalline guitars provide backdrop as Millie Jackson tells her husband to do what makes him satisfied, and if that means leaving her, so be it. She knows that it won’t last, because his new lover isn’t the faithful kind, and that will hurt his ego. As Millie sings this, it’s with a mixture of bravado and resignation, as deep down, she’s worried, that she might be wrong, and he won’t come back. It’s a powerful portrayal and one of the highlights of Still Caught Up. After the bravado of the previous track, it’s a much more confident Millie Jackson that opens You Can’t Stand The Thought Of Another Me as it bursts into life. The tempo is quicker with the rhythm section, piano, wah-wah guitars and cooing backing vocalists accompany a defiant Millie Jackson. She sings that her husband can’t stand the thought of another man now loving her. Later, a punchy rhythm section, sweeping string and braying horns add to the emotion, drama and defiance as Mille Jackson proves takes revenge on her husband who betrayed her. Just when it seems Millie Jackson seems to have the upper hand in the situation, things take a turn for the worse on Leftovers, when her new man announces he’s leaving, and going back to his wife. He’s not for changing his mind, and Millie Jackson reveals that she knows that he’s been cheating on her with his wife. This monologue between Millie and her lover is set against a backdrop of keyboards, chiming guitars and blazing horns as the rhythm section provide the heartbeat. Later, the doorbell rings, and when Millie opens the door is greeted by her lover’s wife. Millie’s response is to throw everyone out, before she asks her love rival how she could stand being second best to her? By now Millie’s vocal is powerful, full of emotion and anger as the arrangement grows in power, during this mixture of music and theatre, where tension and drama are omnipresent. I Still Love You (You Still Love Me) closes the love triangle that is Still Caught Up. By then, Millie Jackson’s husband has left her, and it seems she’s slowly unravelling. After a monologue, there’s a sense of sadness and even melancholy as the arrangement meanders along, the rhythm section, guitars, keyboards and backing vocalists accompanying Millie who is sad, lonely and lost as flute flutters above her. By then, her voice is full of sadness and regret, with almost a sense of grief in her voice caused by the loss of her husband. Towards the end of the track, Millie unravels, and sadly, becomes unstable and mentally ill. Millie Jackson portrayal of mental illness is far from sympathetic and is in poor taste. So much so, that this spoils the ending of what was a compelling and intriguing love triangle. Unfortunately, Millie Jackson didn’t live happily ever after on Still Caught Up, which completes the story that began on her previous album Caught Up. This was the album that launched Millie Jackson’s career in 1974, and forty-four years later, is still one of the finest albums of her career. A year later, Millie Jackson’s much-anticipated fifth album Still Caught Up was released by Spring Records, and it was hoped would replicate the success of Caught Up. Although that wasn’t the case, Still Caught Up is a powerful and moving album where Millie Jackson’s plays every part in this love triangle. The drama that is played out in front of the listener on Still Caught Up is so realistic, that the listener is bound to end up feeling sorry for the characters and taking sides in the various scenarios. Millie Jackson breathes life, meaning and emotion into each and every part on Still Caught Up, regardless of what part she’s playing during an album that is a mixture of music and theatre. Still Caught Up which was released in 1975, features a mixture of monologues and music, which works well and proves a powerful and captivating combination as Millie Jackson plays every role in the second part of this love triangle. It’s an emotional roller coaster, where Millie Jackson veers between heartbroken and hopeful to defiant and confident, to angry and frustrated. Millie Jackson plays each character perfectly, whether it be the wronged woman, to the defiant and newly in love, to the other woman and latterly, the woman who is unravelling emotionally. ← KETIL BJORNSTAD AND ANNELI DRECKER-A SUITE OF POEMS.